Above: Second day "vacation" braid. The past two weeks have been pure bliss...from casual makeup to minimalist haircare, my vacation from work has been filled with much needed respite and leisure. My hairstyle of choice as of late during long and relaxing afternoons at home has been a braid, which (gasp), often gets slept on and carried on into the next day. Like I said...pure bliss. However, what may be fit for home is not as apropos in public so when I was to go shopping with my mom earlier this week, I faced a conundrum. I knew once I too my braid out that the second half of my hair would be tolerably wavy, however, the hours spent close to my head would make the upper half of my hair a fine flat mess. Curling everything with hot roller seemed counterproductive since the ends were already full...what's a girl to do? I know, first world problems, indeed. And then I had an epiphany...why didn't I try curling just the roots? Above: The Calista Ion Rollers come with 12 rollers, a heating station, 12 easy-to-use clips and a travel case for compact storage. I heated up my trusty Calista Ion Hot Rollers for Long Hair (reviewed HERE and HERE) and proceeded with my little experiment. 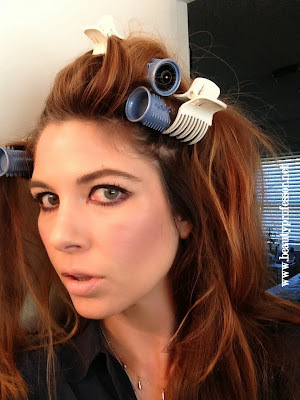 When putting in the rollers, I started at the root and rolled my hair until about half of my hair (from the root until the middle of my hair) was in the roller and let the remaining hair dangle freely; I only used six rollers to cover my whole head! Then, I left them in for about 15 minutes. Above: The "Root Rollers" experiment. Above: The trick was to leave the ends (which were already wavy from a two day braid) alone. Above: Why have I never tried this before?! Bottom Line: As the old adage says, "necessity is the mother of invention!" I highly recommend this incredibly easy method for infusing volume into the roots...all you need are curlers and some creativity. What are some of YOUR favorite beauty shortcuts...please share in the comments section if you are so inclined! Happy weekend, one and all...good things coming up on the blog in the coming days, including products from RMS, YSL and Chanel as well as jewelry and fragrance profiles ; ) And, if you haven't seen it and have about 25 minutes of excess time, please take a peek at my Best Beauty Products of 2013 video...beauty products abound! I love this!!! Your hair looks incredible. And, I am a huge fan of just curling the root. I love volume at the top (the higher the hair, the closer to God, they say) and don't necessarily want curls at the ends. Your end result is absolutely perfect. I may have to invest in those rollers. Lovely, dear friend! P.S. I am so glad to hear you are enjoying your break and getting some much-needed rest and relaxation! Thank you so much...glad to know you are a fellow root curler (though, in light of our similar affinities for everything else, I must say I am not surprised!). 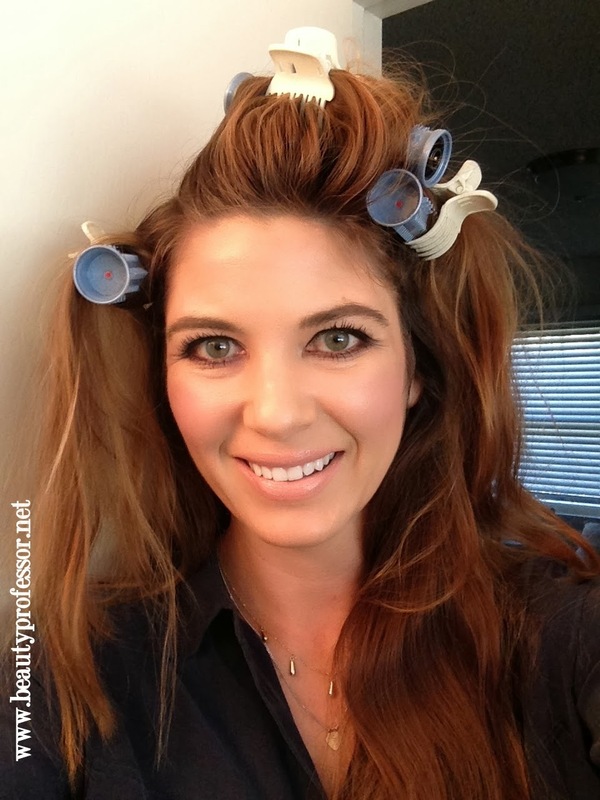 These rollers are truly my favorite and I suspect you will thoroughly love them! Thanks also for your supportive words about my rest time...truly, it was difficult to just "be still" and not work like a fiend, but I think my mind/body needed it. Hope your new year is off to a wonderfully restful start as well...xoxo and talk soon! Your skin looks flawless!!! What m/u are you wearing?! Thank you! In this picture, I am wearing LMdB Peau Vierge plus a combination of Kog Gen Do Aqua Foundation in #213 plus a drop of Ardency Inn Custom Coverage Concentrate in Light-Medium Olive, all applied with a Beauty Blender! So glad you got these...I think you (and your clients!) will love them! Thanks for your sweet words about my skin...as someone who has had my fair share of blemishes over the years, your compliment means a great deal! amazing results! tons of body and movement to the hair. What do you think of these rollers compared to the O Cloud Nine? Thanks, SJ! Both the Calista and the Cloud Nine sets are incredible...it just depends on what price point you are into. I'll say this...the Calista are much more conducive to travel and small spaces since the entire presentation is quite compact. The Cloud Nine are a more expensive investment and entirely luxe, I just think they are better for "at home" use rather than travel. You can get fabulous, lasting curls from either set! I agree with the others....you look amazing! Did you change anything with your brows? This is such a great idea! One of those "why didn't I think of that?" ideas!! I have super long hair and really don't like putting heat on the ends for fear of damaging them. (I tend to overdo it). This look is amazing on you, I'm definitely going to try this! Thanks and Happy New Year! Thank you so much! This process just keeps the heat at the healthiest part of the hair (the roots) and only takes a few minutes. 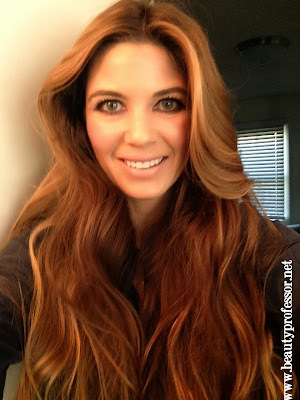 As a fellow super long hair girl, you must try this and tell me how it goes! I can only dream of having hair like that!! Just love the volume you have created and no frizz at all just devine! Do you colour your hair? It's a beautiful colour. Love the hair posts they are really great. I so appreciate your support and comments...it is a bright spot in my day! Wow!! No colouring that is truly beautiful. Fantastic that your Mum cuts your hair for you, that is one thing I hate having to pay for I could be buying something beauty or skincare related with the money lol hence why I get my hair cut very rarely. I hope your having a lovely weekend. Thank you ever so much...I come from good hair genes from both of my parents and cannot take any credit for it myself ; ) I am so thankful that my mom cuts my hair...she knows it better than anyone else! Hope your weekend was marvelous! Gorgeous results! I know this may have seemed like a simple process to you, but I'd love to see a quick video on this, so as to see the width of sections you take and which direction you roll each curl. Just me? Thanks for all your hard work and Happy New Year! Love and blessings in this new year!